The French and Italians both love pastry and fresh fruit, and as I looked at various recipes online, I realized that a free-form pastry with fruit filling can go by either name. 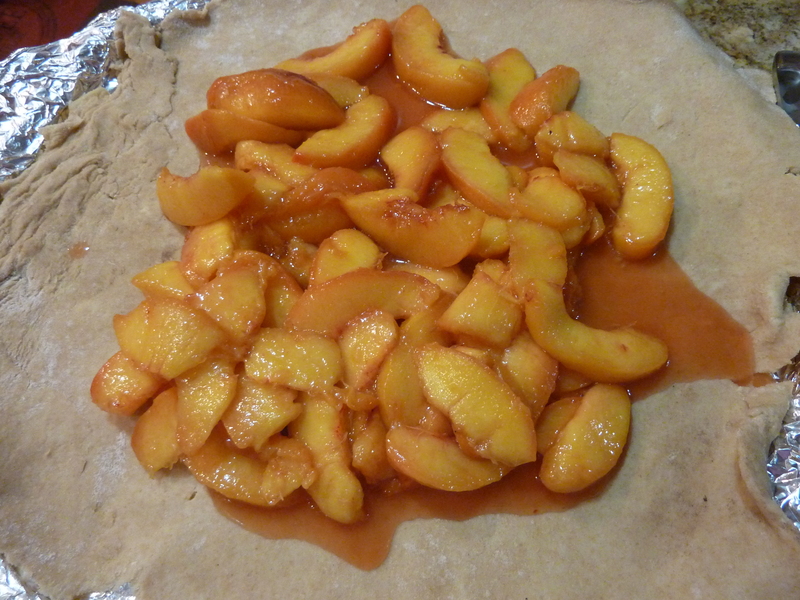 But a galette can be other things, too. 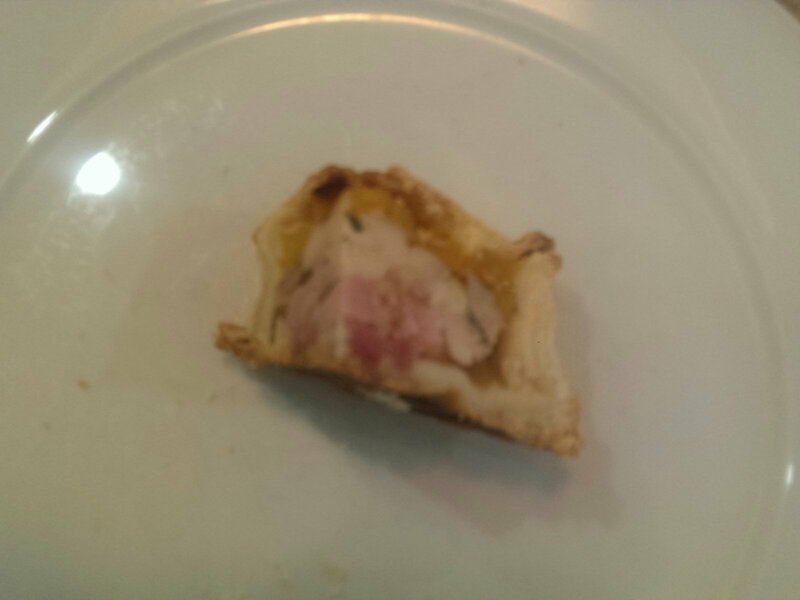 For a thorough examination of the topic, see Dorie Greenspan’s excellent post: I was particularly interested to read about the galette des rois, which I first encountered as a King Cake in New Orleans, where it’s a Mardi Gras treat. Apparently the galette des rois is baked for Epiphany in France, where it resembles an American king cake in the south, but is made of puff pastry filled with almond cream in the north. Oh, and according to David Lebovitz, the northern France-style galette des rois is sold the rest of the year as pithivers. In general there seem to be more variants on galettes than crostatas. Confused yet? All you really need to know is it all tastes good! For this galette-which-could-be-a-crostata, it was time for another foray into cream cheese pastry land. My crust was flakier this time, still less flaky than pastries I’ve made with more traditional pie crust recipes, but acceptably flaky. 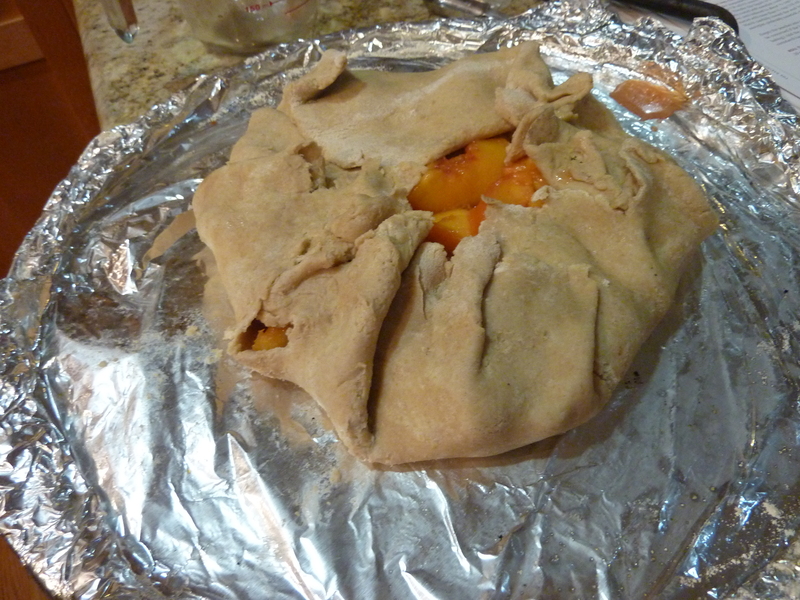 Also, it held together better than any acceptably-flaky pie crust dough of my experience. This characteristic was particularly important in a galette, since there’s no pie plate or tart pan to help things along. I have fewer photos than usual. I made the galette last week, and there were apparently some technical difficulties in the photo-taking, or photo-transferring, I’m not sure which. In any case you’ll just have to take my word for it that the peaches were delicious, It was the perfect time of year for peaches in these parts, and this has been a particularly good year for them. I plunged them whole into boiling water for a short while as directed, and they all gave up their skins without complaint. The cutting and sugaring went off without a hitch, and as I said, the cream cheese crust held its shape like a champ. 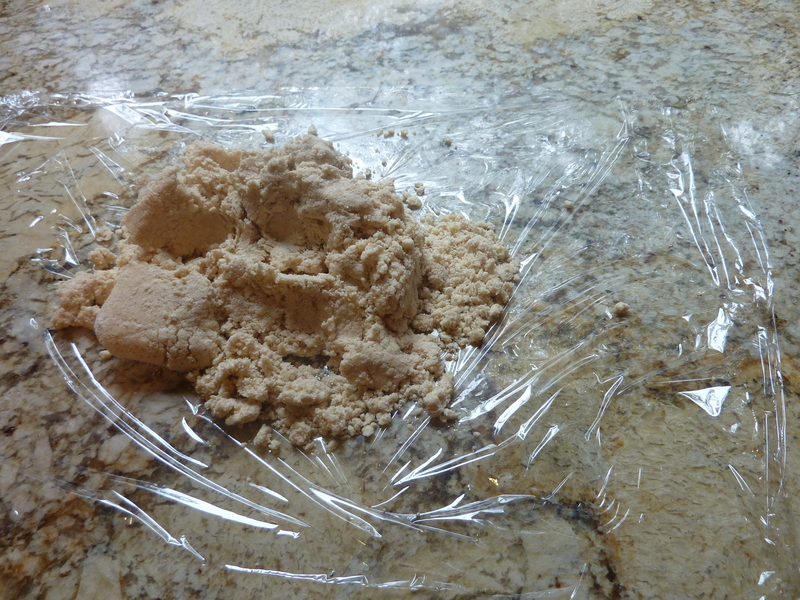 I have always thought of free-form pastries as more difficult than pies and tarts, probably because my pastry dough usually needs much patching and careful handling. What I realized this time around is that while my pies end up looking uneven and a little sloppy, a galette/crostata with the same look is homely in a good way. Galette or crostata, I think there are more free-form pastries in my future. Whole wheat bread this week so I don’t have to buy any at the farmers market! 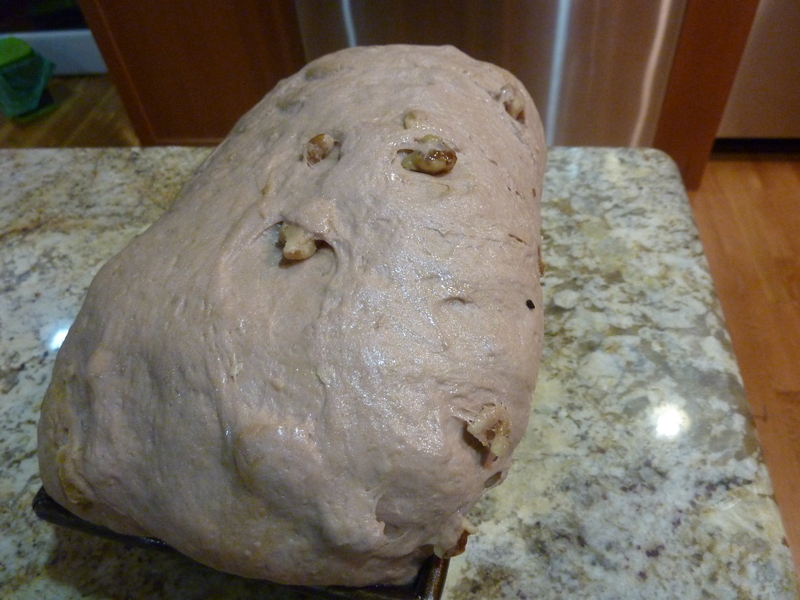 And even better, whole wheat bread with nuts! Alan and I have been buying big jugs of mixed roasted nuts at Costco. He adds them to his yogurt and cereal, I add them to salad or sneak handfuls when the mood strikes. Everything is ready, though the gluten is hiding off to the side. 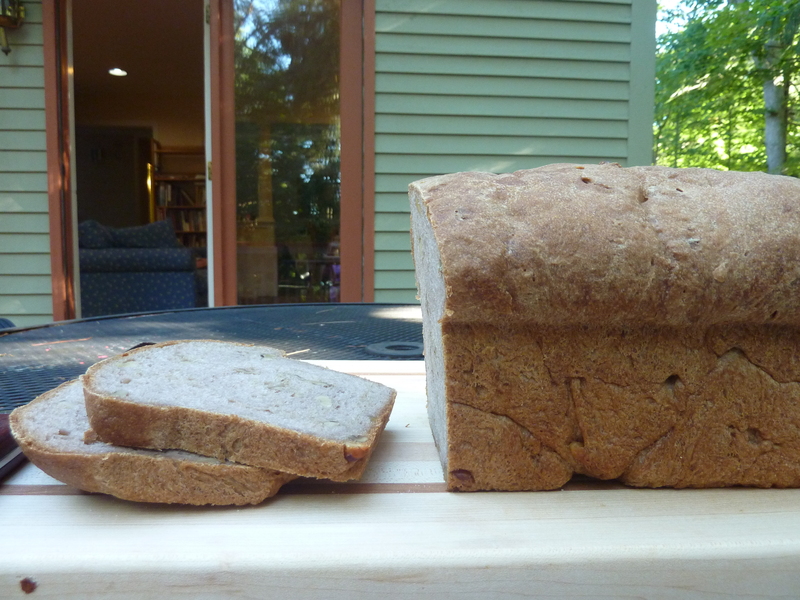 I have Peter Reinhart’s Whole Grain Breads, and I made bread from it religiously for a while, then I stopped. Partly it was because the process took at least two days, but mostly it was just one of those things. The bread sure tasted good. 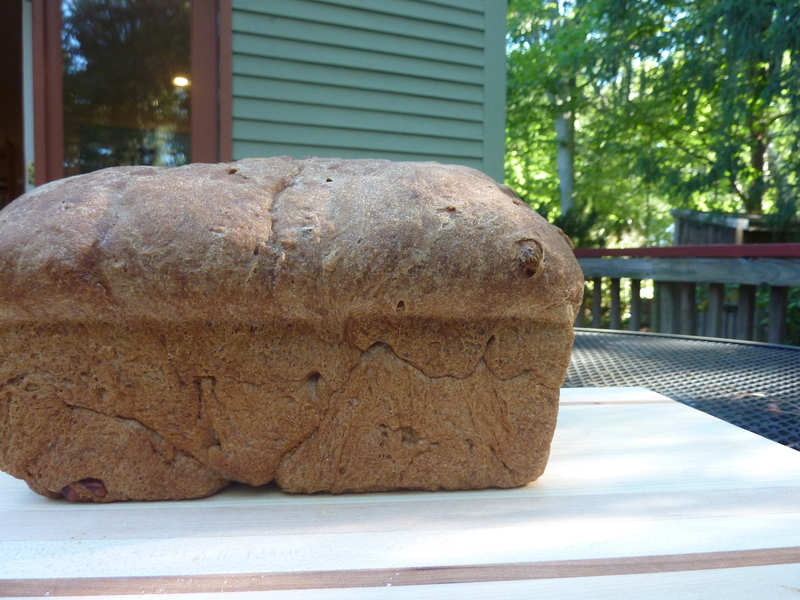 Anyway, I was excited to bake whole wheat bread again, and adding the taste, texture and nutrition of walnuts could only be good. 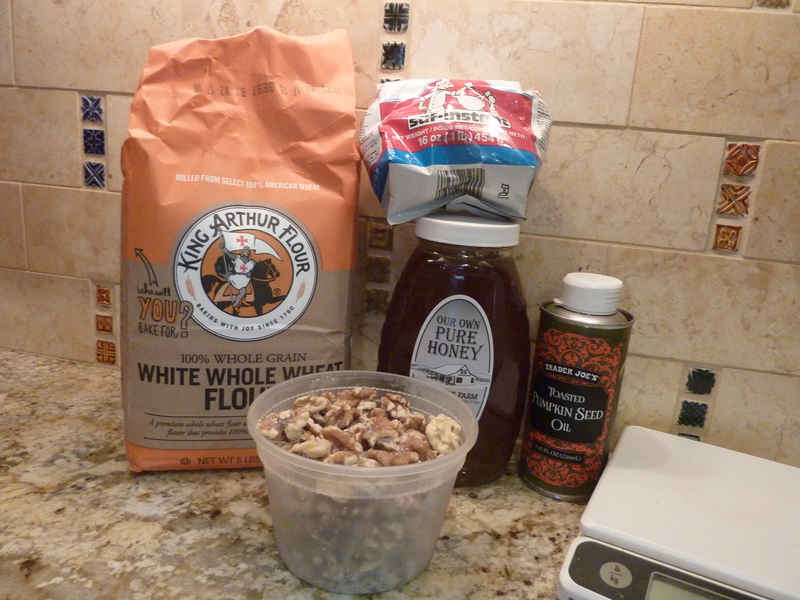 First I toasted the walnuts, and ran into an unexpected complication; my 14-year-old, who kept eating them! Finally I toasted some extras and gave them to her so I’d have enough left for the bread. I also told her we keep a jug of roasted nuts in the same cupboard as the breakfast cereal. Somehow this was news to her. 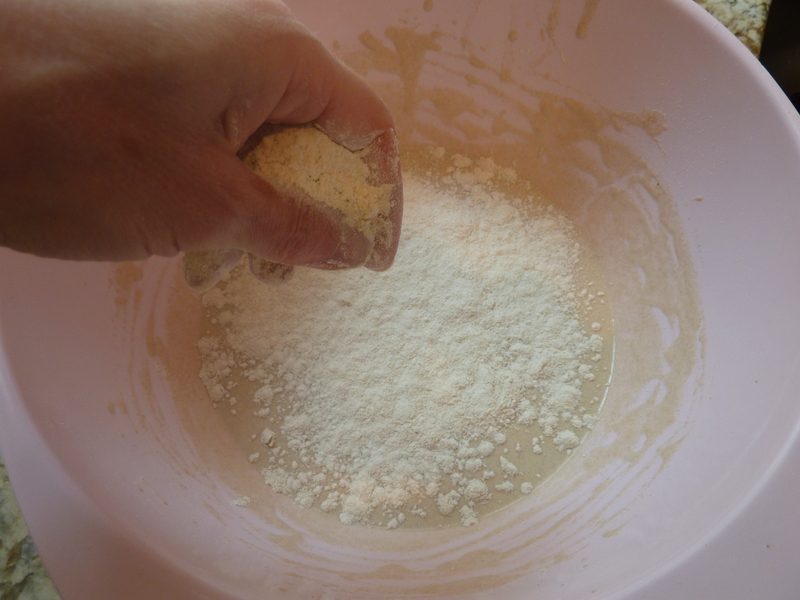 I made the sponge, and sprinkled the flour mixture on top. 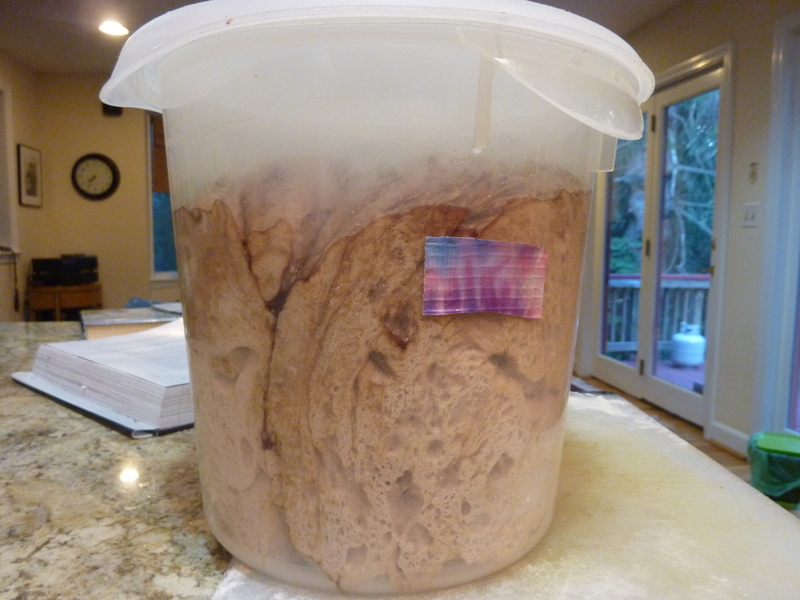 I was a little worried, because my yeast is at least two years old and well past its expiration date. The bottom of the duct tape, legacy of my daughter’s crafty period, marks the 1.5x rise mark, the target bulk for my risen dough. 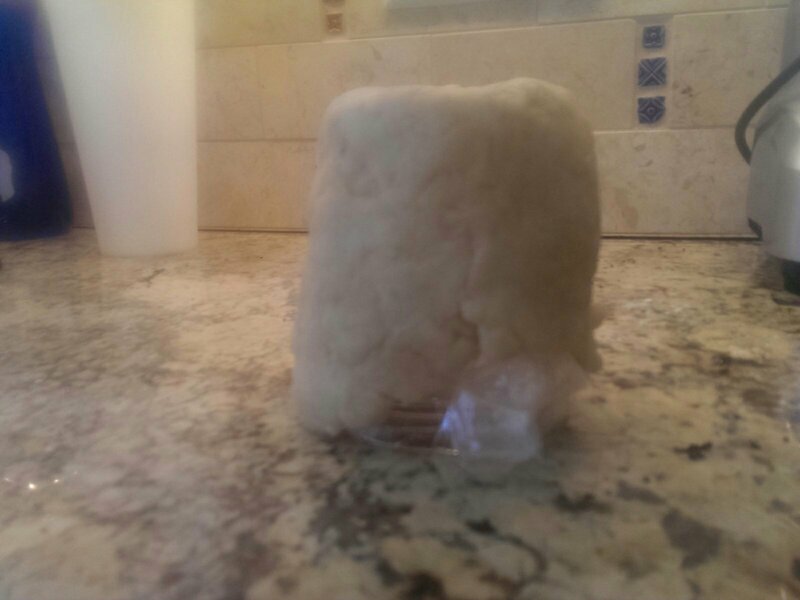 My yeast is still active, no worries. 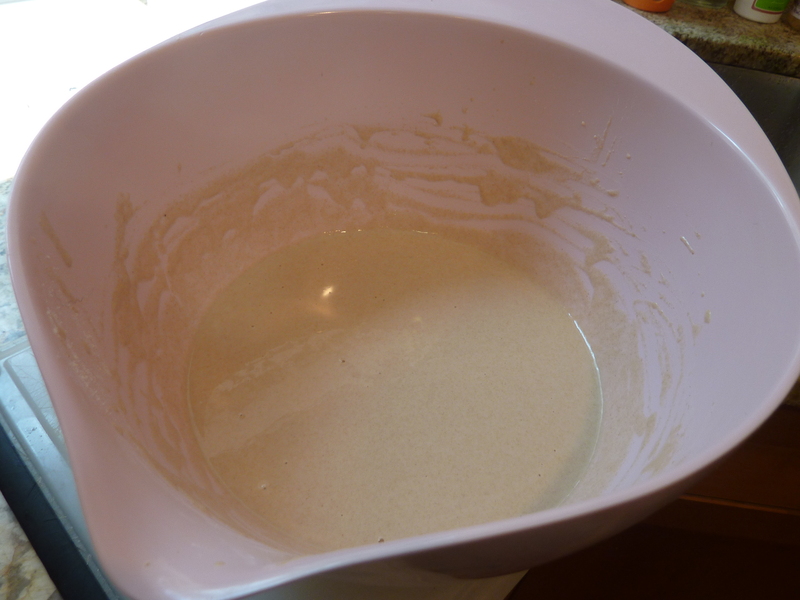 I shaped the dough, put it in the pan to rise, and once again the yeast metabolized for me. An exciting development. My bread almost never expands over the sides of the pan. I bet the gluten helped. This one’s going into the freezer so I can eat it at my leisure. 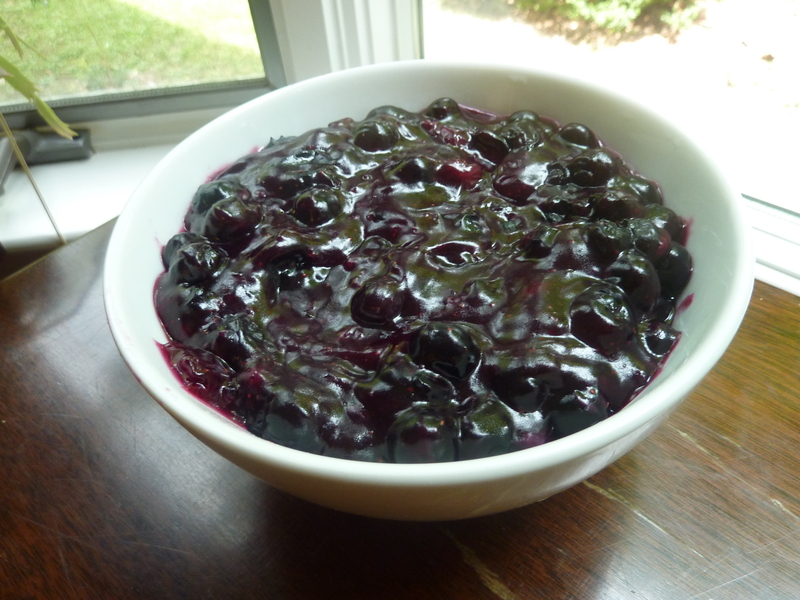 This week’s Baking Bible recipe was for a pie made with elderberries and blueberries. My experience with elderberries to date was in Manischewitz elderberry wine, which, according to their website is “bursting with the flavor and aroma of elderberry pie.” So now I could verify that claim, right? Well, to my dismay the answer was no because there were no elderberries to be found. Not at the supermarket, not at the farmers’ market, not at the local farmstand. So I poked around some, and discovered that elderberry season in New England is mid-August to mid-September, and also that the berries are tiny, grow in clusters that make them difficult to pick by machine, and don’t transport well. So even if I were looking at peak harvest time, the odds would have been against me. I kept my eye out for another tart berry that might work as a substitute, but nothing presented itself. 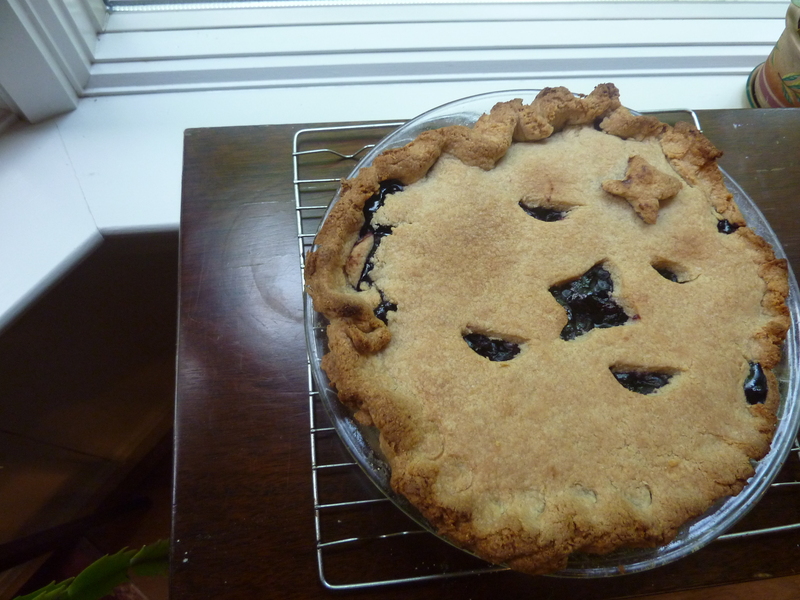 So rather than give up entirely, I made NotElderJustBlueberry pie. First, I had to make the crust. I’d never used cream cheese or baking powder in a pie crust before, but I have immense faith in Rose Levy Beranbaum. Everything in her recipes is there for a reason, and every ingredient has been tested and considered. 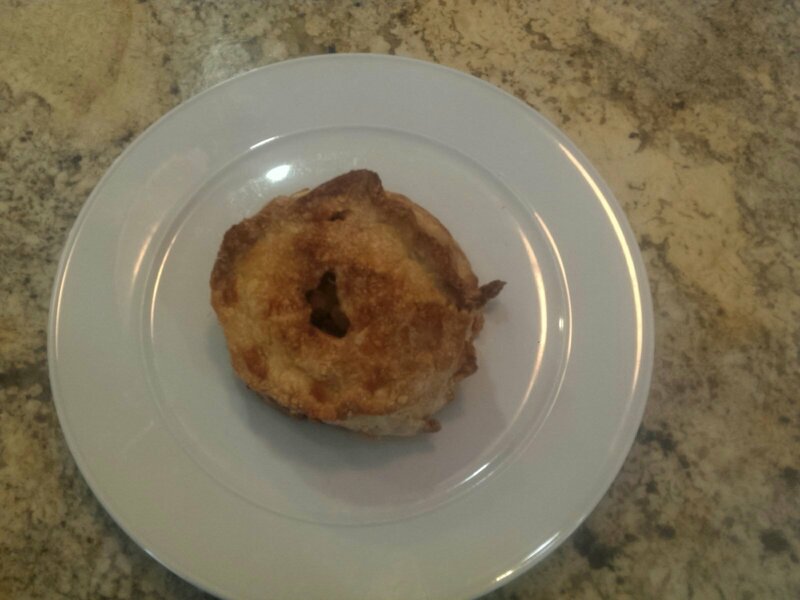 So pie crust with cream cheese and baking powder it was. Oh, and cream! There was cream, not ice water in the crust. On the whole a very different crust experience. 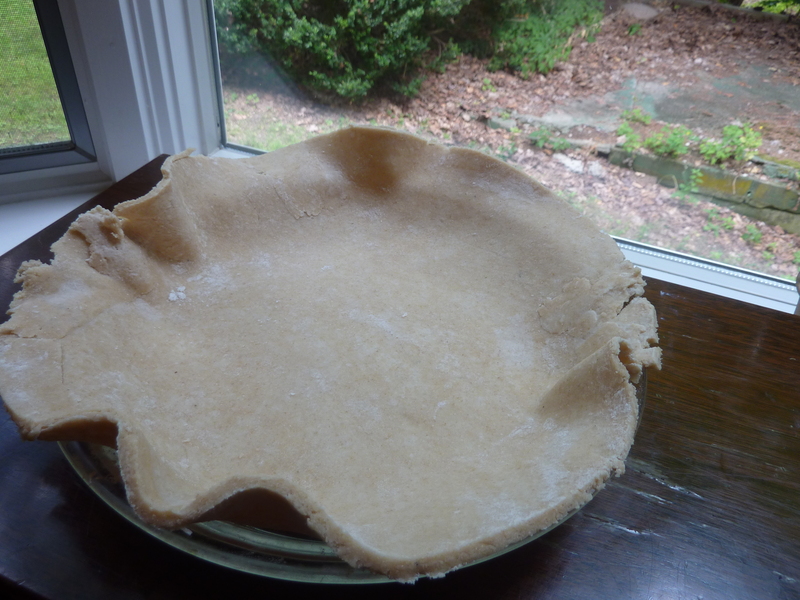 The pot lid was just the size I needed for a perfectly sized pie crust. 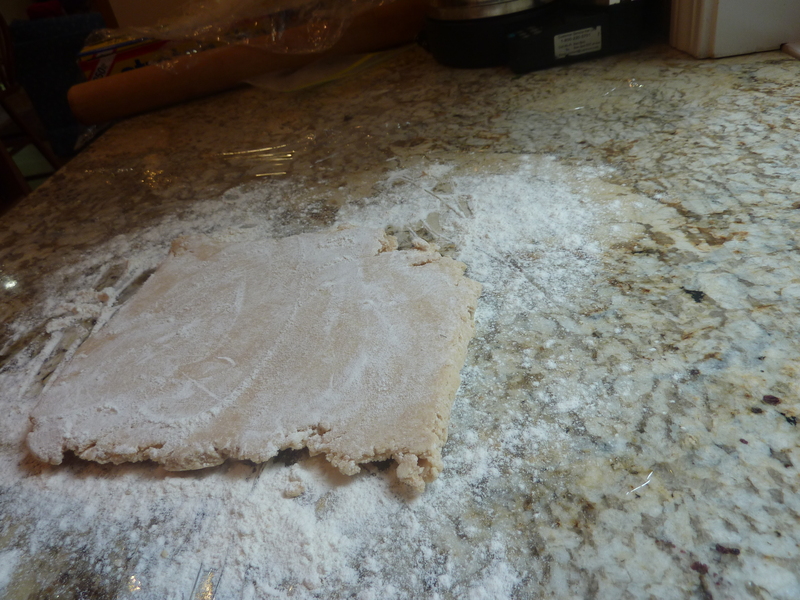 This crust fits much better than the crust I usually produce but as you can see, there were still some irregularities. 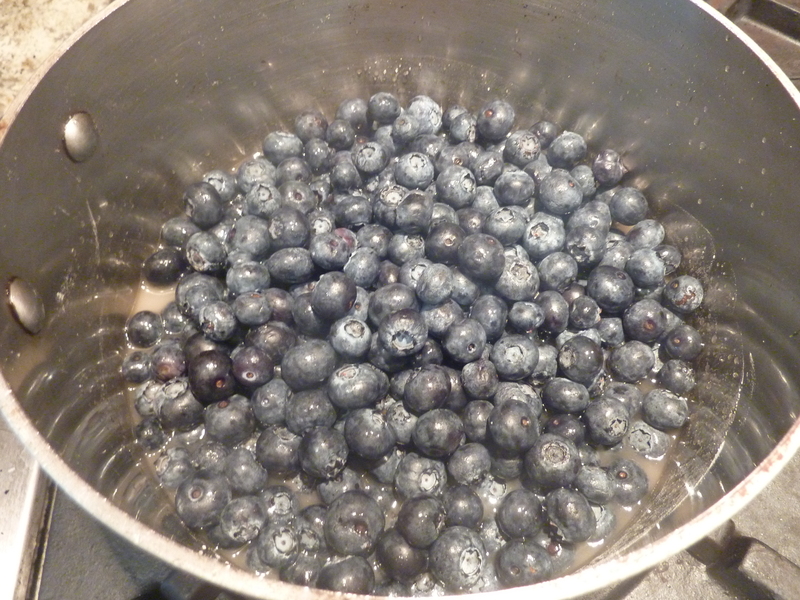 Next I made the filling, cooking the blueberries with sugar, water, and potato starch. 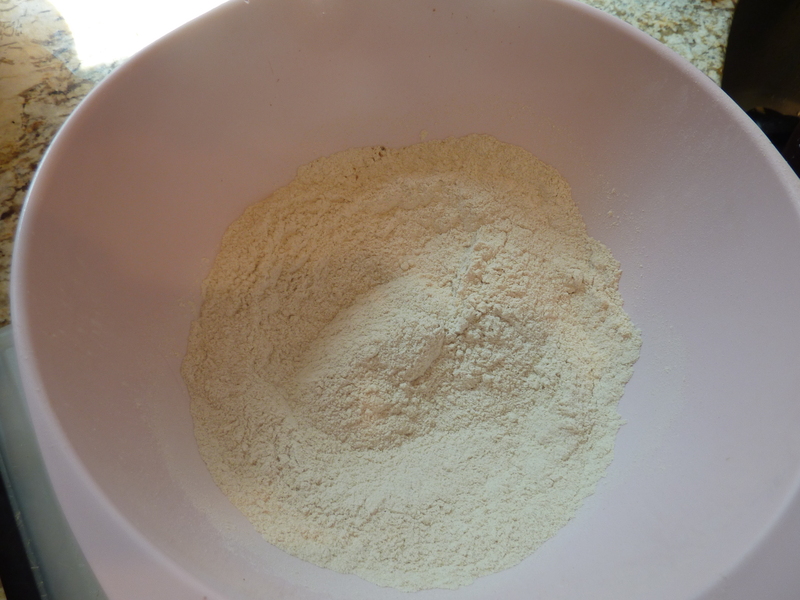 The recipe called for corn starch, but I had none, and I did have a big tin of potato starch. I’m not sure if that was responsible for the very firm filling, or if it was the all-blueberry composition of the fruit, or the fact that I had to leave my project for several hours to bring my daughter to her bassoon lesson, but the filling was firmer than any berry pie I can recall eating. 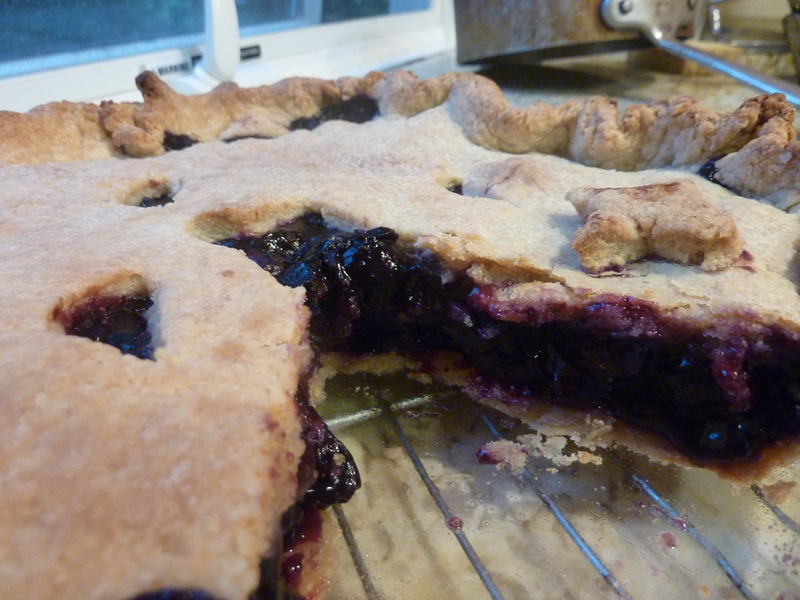 Once again, the finished product below is more uniform than my usual pie, if not quite magazine-worthy. This week’s Rose recipe was Kourambiethes. 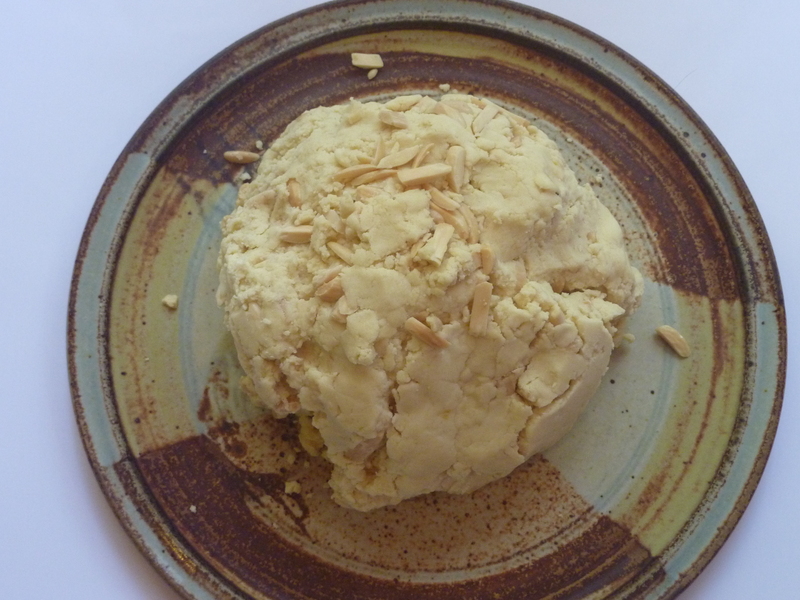 I did a brief Internet search on kourambiethes and their cousins, the Russian tea cake and the Mexican wedding cake/polvorone. It’s a pretty basic recipe. Kourambiethes can have almonds or not, can be decorated with a whole clove or not, and are usually but not always shaped in a flattened sphere. 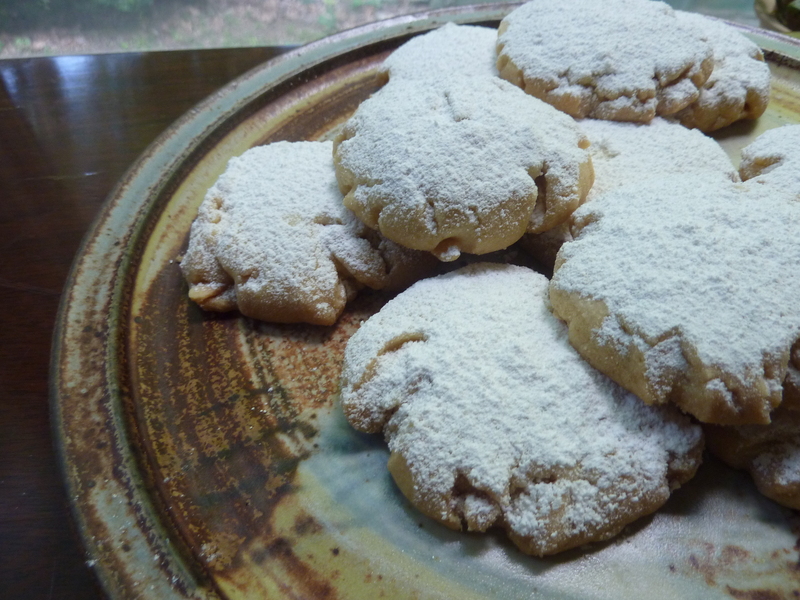 The other distinguishing feature, which still doesn’t show up in every recipe, is beating the butter and the powdered sugar for an extra-long time to enhance the tenderness of the cookie. The RLB version, no surprise, includes the extended beating time, almonds and the traditional shape. Additionally, she clarifies the butter. Big ball of dough. I had some extra almonds, and decided to add them in at the last minute. Now they’re really ready. In deference to the camera, I used a glass to flatten them, instead of my (impeccably clean) fingers. 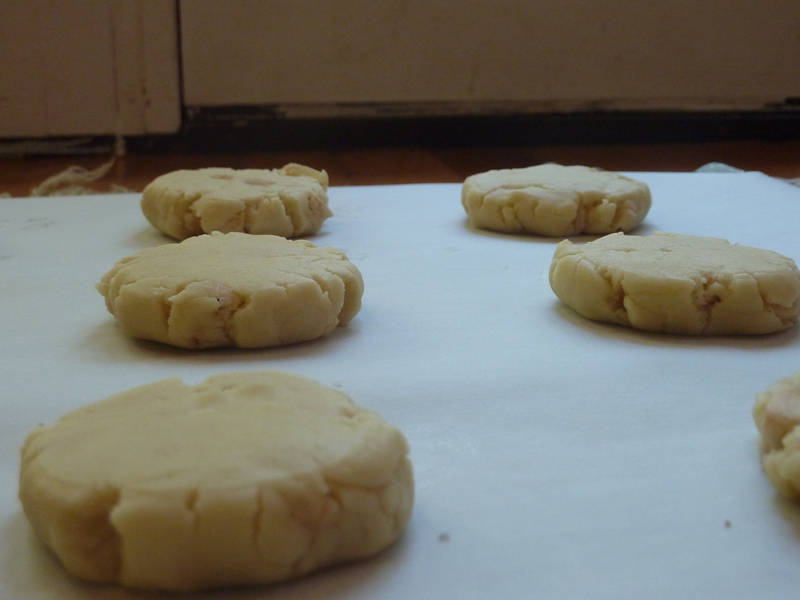 Here are the baked cookies, still waiting to be bathed in powdered sugar. Which, by the way I am buying from Trader Joe’s now, because their powdered sugar doesn’t contain corn starch. I never liked the way corn starch tastes in powdered sugar, and was so happy to discover an alternative! The finished product. My family ate them, but still wanted ice cream for dessert. I’ll chalk it up to our heat wave. 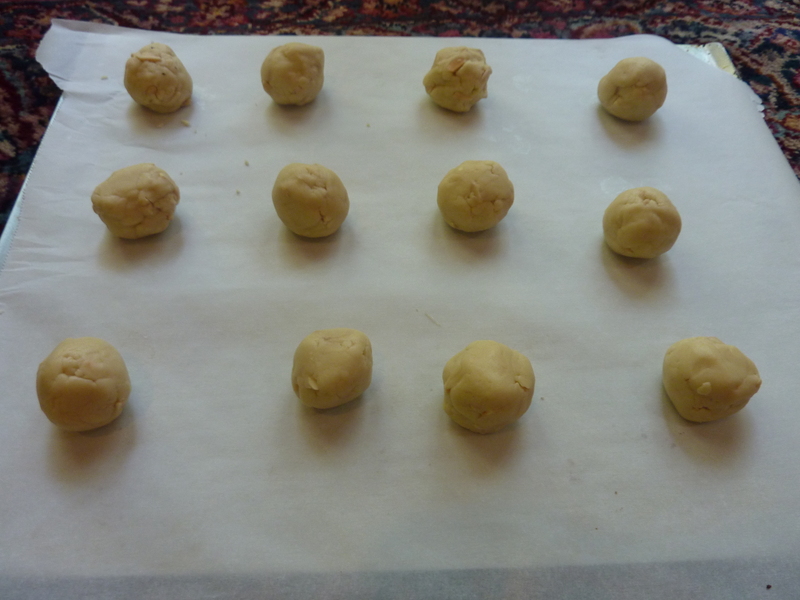 This is my second blog post from The Baking Bible. This one was much easier, and yummy to boot! The cakelets remind me of hermits, though the absence of raisins or nuts ranks them higher on the child friendliness scale. In any case, my older daughter and husband both liked them. The younger one is at camp, so she was unable to give her opinion. I considered sending her some, since the Baking Bible says they’ll keep for a week at room temperature, but I already sent her a boxful of treats so I think we’ll keep these for ourselves. 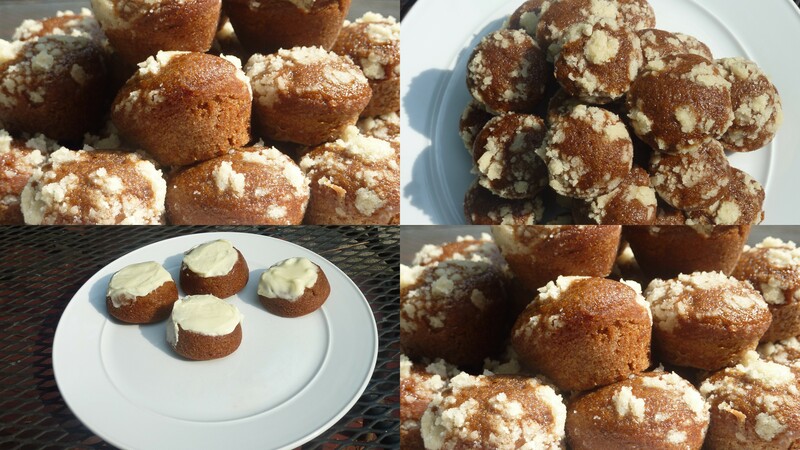 I filled my mini muffin pan and baked it, then took the leftover batter and made cupcakes which I frosted with the leftover white chocolate frosting from last week’s cheesecake. An excellent idea if I do say so myself. 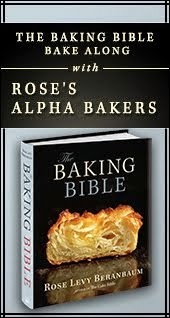 Way back in November, I signed up to bake recipes from Rose Levy Beranbaum’s latest book, The Baking Bible. I love RLB’s fanatical art-through-science approach to baking, and I thought it would be a good opportunity to lend structure to my experiments in the kitchen. Alas, there were too many cooks in the digital kitchen and I went on a wait list. This past Thursday I got an email from Marie, who manages the list, telling me that a spot had opened up. 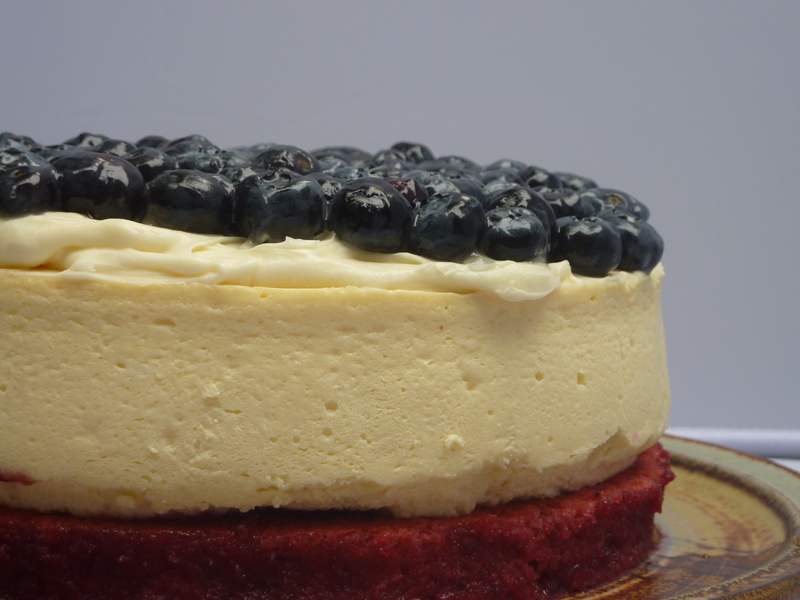 😉 So without further ado, here is my first contribution, Fourth of July Cheesecake. 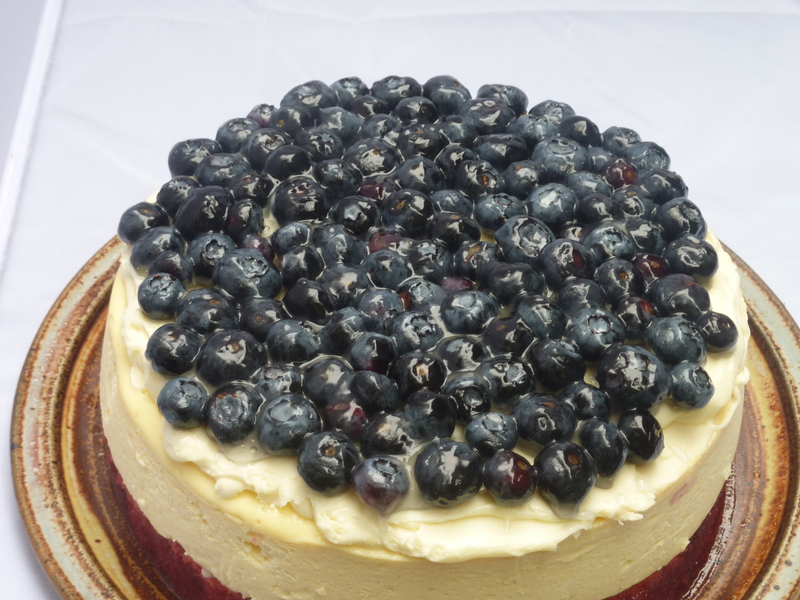 My cake is less red than the picture in the cookbook, I suspect because I used the unbleached flour in my pantry rather than buying bleached flour, which was specified in the book. 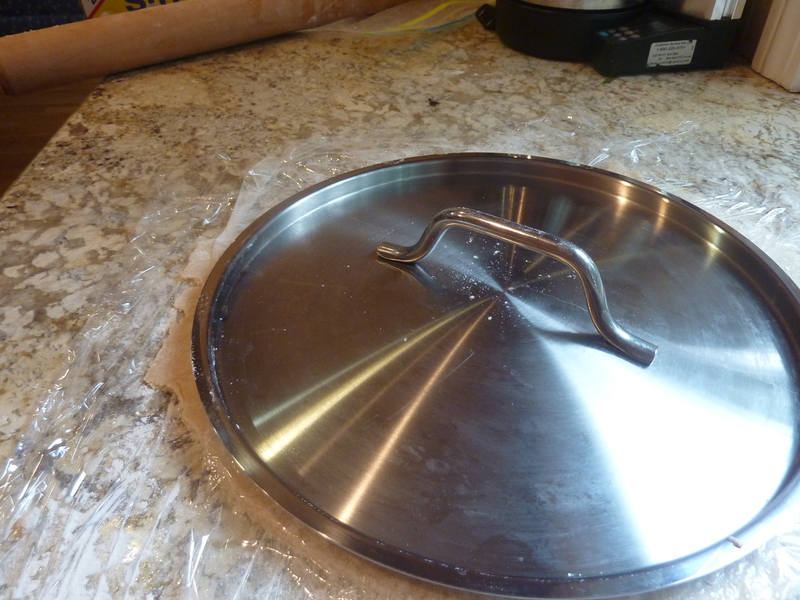 Also, I had only an 8 inch springform pan, so the cheesecake layer is higher than it should be. I considered slicing it horizontally so the proportions would be better, but decided the risk of creating an uneven surface was too high. 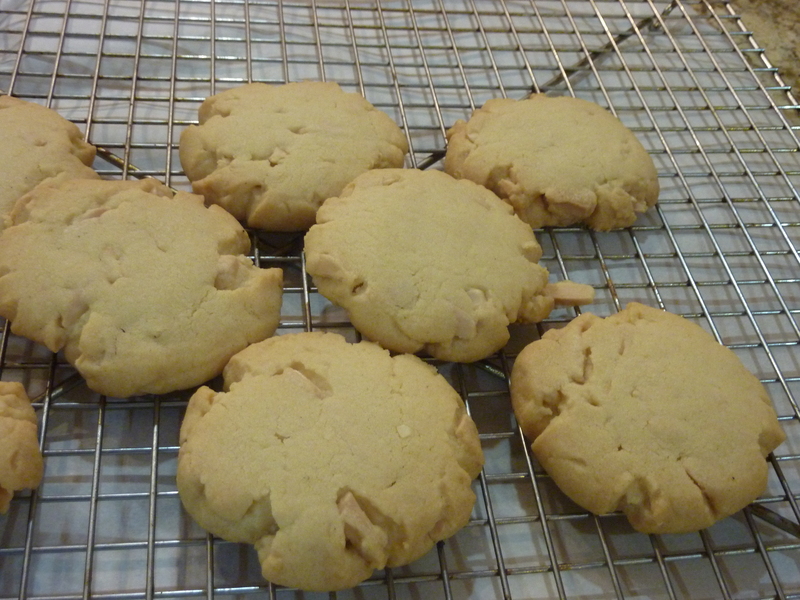 There were no white chocolate chips containing actual cocoa butter at my local grocery store, to my dismay, so I bought a brand name bag of chips but also bars of white chocolate so I could compare the two and make an informed decision about what to include in my white chocolate frosting. There was no comparison. The chips were like smooth, sweet chalk compared to the bars. Guess I’ll have to unload the chips on some hungry teens sometime. Dan Barber, a chef who’s been making a name for himself in the slow food and ecologically sustainable niches, will turn his Manhattan restaurant into a food waste pop-up. For two weeks in March, maybe longer if it’s successful, WasteED (I love the name, with its pun and the echo of TEDx) will use food discards from other companies. While the articles I’ve read about the project emphasize chefs’ ingenuity, I think encouraging people like you and me to think in terms of using ALL of their food is the most interesting prospect here. Anyone who can make this appetizing has my respect. This is a food blog. Or maybe it’s a thoughts blog. Or possibly it’s a reading blog. Most likely it’s a combination of all these, in proportions TBD. All I know it that it’s time to add writing to all my thinking and reading and cooking.